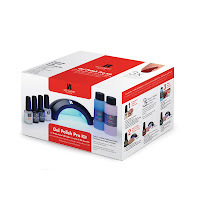 Last week I came across the Red Carpet Manicure Gel nails Pro kit *OMG that was a mouthful * at London Drugs In Vancouver and thought hmmmm I have always wanted to try this kit . I bought the Pro kit at the price of 99$ plus some change plus i bought a few extra colours because I'm not a huge fan of red nails ( I am more into the reds and purple's ) . I brought the kit upstairs and read all of the instructions and started to apply the product. I must say it took a bit longer then I expected but I guess that's because I am new to this system and didn't want to mess up and have ugly nails. I have to say the end result was better then I expected and was really easy to use the key is to use thin coats and to seal the edge of your nail it can be a bit tricky to do so if you have short nails like mine . I have since changed the colours up and it now takes me half the time to get the end result . In my Personal opinion I would have to say this kit is very worth the price tag. This is really cool...and great buy! I'd love to try this..but I'm terrified I'd make a disaster of myself! It's super easy to use!! I also thought the same thing and it took me a while to really get the hang of it the key is thin coats!